A new choice from the library that has gone in to heavy (heavy heavy) reading rotation.It's a cute story, though the message seems to have gone right over my daughter's head as she thinks it would be wonderful to have a collection of mice living in her hair. Again, I was faced with a book full of mice! Rodents creep me out in the worst way. But I was determined to read this book as it looked fabulous and I very much enjoyed Bernheimer's, The Lonely Book.In this book, a girl with gloriously thick and long hair refuses to brush her hair. One night the mice begin to move in one by one and make a cozy little nest out of the girl's hair. Before long, problems begin. The mice don't like water so the girl doesn't bathe. She can't sleep because the mice are so noisy and she doesn't want to crush them. This goes on until the final straw...the teacher won't let the little girl bring her baby doll to school because she already has enough friends in her hair. The girl chooses baby doll over the mice and bids farewell.The illustrations in this story are rich, colorful and full of interesting background bits that draw the eye. I wanted to look over every inch of every page. This story brought me back to the days when we spent hours brushing "rats nests" out of my own thick and curly hair. Thankfully it never got so bad that mice moved in. I lost a few things in there occasionally though.I highly recommend this book to all children (except those like me who are afraid of mice). It has a wonderful message about hygiene and it is hilarious good fun. My 4 year old saw this at Half Price Books and wanted it. As a reward for her good behavior while out shopping, I bought it.This is a cute story about a little girl with long beautiful hair, which she refuses to brush. (Hmm.... sounds like both my daughters!) What happens when the girl won't brush her hair? Well, little mice move in of course. The girl, not being afraid of mice lets them stay and before you know it, she's got a whole colony of mice! The mice however, do not like the water. They demand that the girl not bathe, and since the girl likes her mice friends, she stops bathing. Before long, nobody wants to be around the girl (not even her baby doll!) She has to make a tough choice: let the mice stay and be stinky and dirty, or send the mice packing and clean up. I love the artwork in this book. It's a CG style, very much in line with current cartoons like Tangled, about another girl with long beautiful hair. The pictures are bright and vibrant, the mice are adorable. Both my girls (4 and almost 9) enjoyed the story and looking at the pictures.I had high hopes that this book might encourage my girls to let us brush their hair, alas, those dreams were crushed. They both still cry when it's time to brush their hair, but at least they don't have mice living on their heads! Got this from the library in hopes of convincing Kathryn that brusing your hair is a good thing. She still doesn't enjoy it, but at least she doesn't have a colony of mice living on her head. The story begins with a girl who had beautiful brown hair. After her bath each night, she wrapped it in a turban, but refused to brush it. After a few nights, after taking off her turban, she found a mouse had taken residence in a gnarly, ratted section of her hair! The girl was not afraid of the mouse, remember in the fairy tales that mice are the helpers. She left the mouse and told her grown ups "it's just my way". The girl woke up to find another mouse decided to move in, bringing baby mice with it. The girl didn't discourage the activity, so more mice moved in too! Soon, school children stopped brushing their hair too, in hopes of housing mice in their hair. The girls mother refused to feed the mice, so the girl was required to share hers. She was hungry! Her new friends didn't like baths and squeaked refusals to her. So, she also refused to bathe. Pretty soon, her hair resembled a palace. And the smell, oh the smell! It appeared the mice were in charge of the girl, not the other way around. She found it difficult to get to school, because she slept horribly at night, and because she had a rough time dressing with mice in her hair. Her teacher explained to her that her doll can't come to school because she's bringing too many friends, the mice. She bid the mice farewell that evening, because "baby" was her first ever friend. Carefully, the mice left, singing a sad tune. After they left, the girl took a bath and for the first time, brushed her hair. This was definitely an interesting story! The pictures were bright, the writing had depth, but it just wasn't my style of book. The plot was well developed, beginning from the first moment she stopped brushing her hair, to the evening she evicted them. A cute book, just not for me. This book is a funny tale about a girl who neglects to brush her hair, and eventually has a neighborhood of mice living inside of it. The illustrations are 3-d and wonderfully drawn wit solid details and neutral colors. The way the Mice society within the girls hair is drawn is creative, detailed, and complex. The story is a wonderful lesson on self-grooming and how not everything that glitters is gold and how the girl may have liked the mice at first but there is always too much of a good thing. This book is a good read for younger kids. This was a funny read for me mostly because my mom gave it to my as a joke since she thinks I "never brush my hair." This is an entertaining read for younger kids because the events that happen to our lovely heroin, will teach them to take care of their hygiene and not think it doesn't matter! This book, The Girl Who Wouldn't Brush Her Hair is about a little girl who has very long hair and hates brushing it after she takes a bath. She tells her parents that she will not brush her hair before bed and goes to bed with wet, knotted up hair for a few nights in a row. Then one night she finds a mouse in her hair nestled into one of the biggest knots she has. At first she is concerned but once she realizes he is a nice mouse she lets him stay. This one mouse turns into four mice in the morning and the mice keep coming until she has about one hundred mice!! What will happen to the girl who wouldn't brush her hair? Will her head keep filling up with more and more mice? Read this book to find out!If I was going to use this book in a class I would probably use it with first graders because I feel that they would get the humor the best and would still think it is cute. For this activity I would have everyone sit in a circle and we would go around the circle with every kid saying one word describing the way that this would make them feel if they had mice living in their hair. Then we would have a short group discussion talking about this question from Bloom's Taxonomy, "Do you agree with the girl who wouldn't brush her hair and the decision she had to let the mice live in her hair? Why or why not?" Then we would also discuss the question "What choice would you have made if you were the girl who wouldn't brush her hair and if you were in her situation with all of those mice living in your hair?" Then I would turn to my chalkboard and I would ask the kids this, "Create a new ending to this story? What are some other things the girl could have done besides making the mice leave her head?" And as a class we would brainstorm more ideas of things the girl could have done. AR reading level is 4.3 and the interest level is k-3rd gradeBernheimer, K., & Parker, J. (2013). The Girl Who Wouldn't Brush Her Hair. New York, New York: Schwartz & Wade Books. I loved this book. The digitally coloured illustrations were perfect and brought the storyline to life. All the details in each picture were just delightful to peruse. A little girl with beautiful, long hair refuses to brush it because she says, "It's just her way." Her hair gets matted and tangled and a mouse decides it is the perfect spot for nesting and perhaps a perfect spot for a permanent home. Word gets out that there is a mouse in hair-residence, so the other mice decide to try their luck to see if there is "room for one more." The final count of the squatters is one hundred. One hundred pesky rodents who tell her knock-knock jokes, set up a film projector to watch movies and even concoct a cheese cellar. These little inhabitants become unruly and bossy, even demanding she cease from bathing because they cannot swim. The little girl finds because of her unkempt and unsanitary state her friends at school and even her parents step away from her. Finally she makes the big decision that she wants her old, hygienic life back, washes her mice-infested hair and gives herself a good scrub in the tub to regain her fastidiousness and her sanity. What will happen to her mice tenants? Will they find a place to reside other than her long, silky locks? Does the story have a "and they all lived happily ever after ending?" I suggest you get a copy and find out the demise of the annoying, furry little critters. The book is a fun read and kids will love the plot and especially the visuals. Who wouldn't want your own animated mousecapades scurrying around in your hair, something that can add some excitement to your boring life? I wouldn't that's who...makes my head crawl and itch just to think about it. But it makes a perfect tale to spin to children and they will love it. An obstinate young girl decides she will stop brushing her hair. After her daily ritual of washing, toweling and brushing, she announces one night, to her constant companion doll, Baby, that she will not do it anymore. When the adults in her life question her, her response is "It's just my way." It isn’t long before a mouse takes up residence in her tangled hair. She is unperturbed and welcomes the other mice that follow in droves. Soon her hair is a matted mess and a veritable village of mice. They tell her jokes, steal her food and even convince her to stop bathing because they cannot swim. All the mouse activities soon take their toll and even cost her friends at school. She finally realizes things have gotten out of hand when her teacher gives her an ultimatum: it’s either the doll or the mice, you can’t have both at school. Well, the choice is clear: Baby trumps mice. The mice take the news good-naturedly and spy a little girl with braids playing on the monkey bars; they won’t be homeless for long. So the story ends happily for all concerned. The lively narration is paired with muted penciled illustrations that capture the fantasy of the tale and feature her oversized hair and head and the endearing mice, of course. This whimsical tale is a study of the absurd, and very young readers will be delighted by it. It offers opportunities for teaching cause and effect and inference and could be a springboard to other imaginative situations, and it would be a no-brainer as a read-aloud story. A young little girl does not brush her hair because that is just her way. One day, a mouse decides to make a nest in her hair. And soon after, there are hundreds of mice that have moved in. At school, her teacher tells her that she can no longer bring her favorite doll, baby, because she already has too many friends that come to class with her. Baby is her favorite doll though. The doll seems to change her facial expressions as the scenes change too! The mice become such a hassle, that the girl has to choose between them and having a normal life. The illustrations were soft and beautiful. They were calm, just like the tone of the text. I did not think the plot was too interesting, but it was still a good story. I do not know if I would use this in a classroom, but I would definitely consider keeping it in my class library. I could personally see a parent use this book to children that may have a hard time taking baths. A young girl refuses to brush her waist-length hair. "It's just my way," she says. When mice move into her hair, the girl seems not to mind. But then problems begin. First, her mother won't pack a lunch for the mice, so she has to let them eat hers. Also the mice won't allow the girl to take a bath as they don't like the water.Finally, the worst thing possible happens: her school teacher informs her that she will no longer be allowed to bring Baby, her favorite play toy, to school with her. Each child is allowed one play toy at school and since the girl has hundreds of mice in her hair, it isn't fair.Finally, finally the girl has a talk with the mice, explaining to them that she needed to eat, and bathe and be able to take Baby to school. The mice move on without complaining, quickly finding another little girl that won't brush her hair. What happens when a young girl doesn't brush her hair for days and proclaims--"That's just my way?" Well, if it were my mom she'd say, "It'll grow rats" because somehow early 20th century Taiwanese in the rural country side still believe in spontaneous generation, as if Louis Pasteur never existed. Here's an amusing tale on the very subject. Not brushing your hair for days can breed rats. And guess what? They even tell knock-knock jokes. They set up secret passage ways, cheese cellars and moats in her tussels of dirty hair. Finally the girl can't sleep, the knock-knock jokes get old and her teacher put her foot down and says she can only have one friend at naptime. The mice know they have to leave so they sing a mournful song, indicating they will be inhabiting a new head very soon. Beautiful air-brushed pictures and funny storyline will keep kids entertained. This story book was an exaggerated tale of what can happen when you do not brush your hair. A group of pesky, yet cute mice can move into your hair. The mice were in heaven as they created a "wonderful" nest in the wild unkempt hair of said little girl. As the days went by, she realized the messy hair was causing other hygiene problems. Because the longer she didn't brush her hair, more mice moved in (creating a "hair-in" movie screen, swimming pool) she couldn't bath. It was causing schoolmates & her parents not wanting to be around her. So it has a happy ending, she finally baths and washes her hair. The mice do have to find other accommodations, but they are really good sports about it.This was a funny book about the importance of being clean. It's a little hard to get mad at the mice because they were really cute. This book gives a hole new meaning to "rats nest" as a girl who didn't like her hair brushed for days, I understand the whole "rat nest" thing as my mom said it all the time. But I think If someone had read this book to me when I was little maybe I would have let my hair be brushed. I do not like the thought of mice living in my hair....I don't like the idea of mice living, period. So if you want to scare your child into washing and brushing their hair this is the book (PS I didn't mind having my hair washed, I just didn't like it brushed...I think it is because my mom was so aggressive with her strokes and it hurt my head....Although I have forgiven her...she always burned my ears with the curling iron (not on purpose.. don't call CFS). It took many many year to ever want to curl my hair. 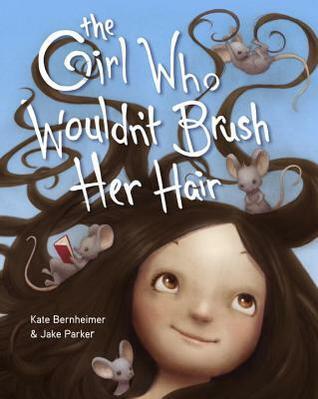 The Girl Who Wouldn’t Brush Her Hair is a good book about hygiene that both girls and boys are sure to enjoy. The main character refuses to brush her hair after her nightly baths, as “it’s just my way.” As a result, mice begin moving into her hair which the girl gladly welcomes as they tell knock-knock jokes and are nice to her favorite toy, Baby. Unfortunately, caring for all these mice becomes problematic as they eat all her lunch, keep her up at night, and refuse to let her bathe which results in her starting to smell. This book is a good book to discuss hygiene with children and how you need to bathe, wash, and brush your hair to keep yourself clean. The illustrations in this book are eye catching and do a good job imparting the emotion the girl is feeling on that certain page. This children's book is absolutely adorable! It is the playful tale of a young girl who refuses to brush her hair because "it's just her way." Because she's read so many fairy tales with kind mice, she allows one to move into a particularly tangled portion of her hair. Soon, word gets around to the mice community that there is a nice girl letting mice live in her hair. As more and more mice move into her hair, the girl begins to realize that having mice live in her hair isn't all that fun. By the end of the story, she has learned the importance of brushing her hair. This story is quite playful, and I would definitely use this book to kindly talk about good hygiene. This book has a good premise: a little girl who refuses to brush her hair learns a lesson slowly but surely. She does seem slow in learning it, however. It is not enough for one mouse to make a nest in her hair and take up residence. It's not even enough three dozen mice to take up residence in her hair. The mice are unruly, bossy, and nocturnal...It's a fun and playful story starring a very stubborn heroine. The illustrations, in a way, are just as fun as the text itself. I liked seeing what the mice were doing in each picture. The story has a good resolution too. This story reminded me--in a good way--of a Mrs. Piggle Wiggle story. A young girl, with beautiful long hair, refuses to brush her hair after bath time each night. Her response is, "It's just my way" when explaining to her parents. One day, a mouse decides to make her hair its home. Then more and more mice come to live in her hair. This brings about all sorts of problems, as the mice began bossing the girl around. Finally, enough is enough and the girl has some decisions to make. I thought the illustrations were perfect for the story, somehow adding a sweetness to a less than sweet thought (mice living in a girl's hair. )I think my K-2 students would really enjoy this book! Too cute for words, this is a story of a little girl who refused to brush her hair. Eventually mice found a happy home in the tower of matted hair. First one mouse, then 100 mice, living in a room, warm place, bothersome only because they tell stupid knock, knock jokes, yet, the time comes for them to go.But, until then they scurry about in the hair home complete with a tennis court, a film projector to watch movies and a cheese cellar.This was just the right book to read when the sky is grey and the house is warm and cozy. My 9-year old daughter, who recently had her really long hair cut (and who hated brushing it), loved this book. The book design was excellent; loved the artwork weaving with the pictures and how each page was filled to the brim with soothing colors. The author and illustrator seemed to work in perfect harmony when they showed the dirty hair and the harsher colors, yet when the girl had cleaned her hair, the colors were more soothing and relaxed. I great book for little ones who resist the routine of bathing and brushing. Recommend. This is about the cutest story I've ever read. The title just starts the story about a little girl who has the incredible fortune of being able to confidently say that she does things her way which leads to some interesting developments. Not brushing her hair is the reason that she befriends a mouse with a suitcase full of fairy tales. Hair condos are the latest craze and baths become a thing of the past. The kids had a real hoot with this one lol. I really enjoyed this book, and I think that this would be a great book for younger girls. At a young age I also did not want to brush my hair and thought that it hurt and even though I did not end up with mouse living in my hair I think this is something that a lot of young girls can relate to. It also gives it a comical spin on the book so that even the boys would enjoy this book if read aloud. This book teaches children to enjoy who they are, and rock whatever hair they were born with. The Girl Who Wouldn’t Brush Her Hair is a funny cumulative story about a girl who refuses to wash and brush her hair, so all sorts of strange things start happening to her and her hair. Soon the girl finds out that taking care of her hair might be important. This book is a fun read aloud for students with big imaginations, and it would be great for early elementary students. Who knew that a book about personal hygiene could be so entertaining! I love clever picture books that teaches the children a useful lesson. Also liked the perspective that even if "it's just your way" you still need to take care of yourself. Since the consequences isn't usually mentioned in todays society where "be yourself" is being preached everywhere. I really love Bernheimer's book "The Girl in the Castle Inside the Museum". I can detect some of the same whimsy in this new picture book, but something feels off. Maybe it's that I'm an adult (albeit usually living in the preferable world of children's literature) and am irked that a little girl only needs to say "It's just my way" and is allowed to abandon important grooming basics. Kate Bernheimer - Kate Bernheimer is the author of three novels and the story collection Horse, Flower, Bird, as well as children's books. Among other books, she edited the World Fantasy Award winning My Mother She Killed Me, My Father He Ate Me: Forty New Fairy Tales and the forthcoming xo Orpheus: 50 New Myths.